The Carretera Austral, formerly known as Carretera General Augusto Pinochet, is the result of an ambitious plan by the former dictator to unite what he saw as vital but isolated parts of Southern Chile with the rest of his country. Prior to the construction of this 1,240 kilometer stretch of road many villages between Puerto Montt and Villa O’Higgins were accessible only by plane or boat. Construction of the highway commenced in 1976 and over 100,000 Chilean worked to build it. The Carretera first opened for traffic in 1988, with additional stretches being finished in 1996 and 2003. 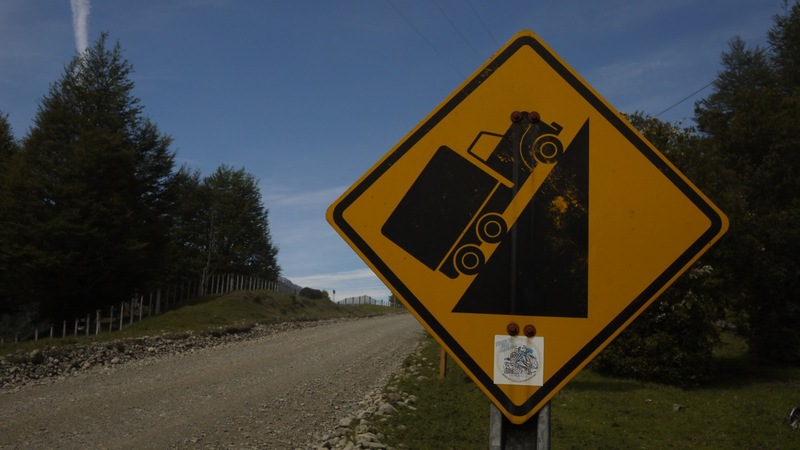 The Carretera Austral is considered Chile’s most ambitious infrastructure project of the 20th century. The road, which winds through a land of glaciers, fjords, mountains, rivers, and waterfalls, changed rural Patagonia for better or worse. It has connected an area once isolated to the rest of its country while also opening the gates for tourism and economic development. While tourists are still sparse, many riding the stretch on bicycle, the plan to pave the predominantly gravel “highway” will likely bring with it more traffic. For now the area is filled with the magic of the unexplored, the magic of small peaceful villages surrounded by raw nature. As part of our journey we decided to take the drive. After sleeping in Parque Nacional Los Alerces on the Argentine side of the border—an AMAZING piece of earth with untouched forests and crystal clear blue lakes we make our way to la frontera at Paso Futaleufú to start our journey south on the Carretera Austral. Just after checking out on the Argentine side we meet another couple who have just finished volunteering with the Peace Corps in Paraguay and are now touring around South America on a motorbike, also heading for the Carretera. They are both from the west coast as well; Anne is from Washington and Jordan from Oregon, although they met while in Paraguay—Jordan lived 4km from Anne’s best friend. We chat for a few minutes and agree to meet up in Futaleufú for lunch and to stock up on supplies, and then we go ahead to the Chilean border. The aduana agent quickly points out a critical missing component in our passports: no Argentine exit stamp. Chileans always insist on properly stamped documentation, which requires us to return back to the Argentine side before being allowed our Chilean entry stamp. Passports properly stamped, we tell the agents we had nothing to declare and head back outside to go over the contents of the van. They want us to take out the snowboard bags to look them over, but nothing too intrusive, and they start looking over the interior of the closet and cabinets. We threw away our delicious raw honey and pollen before getting to the border but forgot a bag of garbanzo beans. As soon as the agent spots the contraband we remove it from the van and toss it into the trash, but this is apparently not in line with Chilean protocol. We must get the beans out of the trash can, go back inside, fill out a new declarations form, mark that we have agricultural products to declare, and then hand the beans over to the agent so he can toss them into the very same trash can. Going through this process spares us the fine that goes along with being caught smuggling legumes and allows us entry into the country. Once in Futaleufú we are reminded of one downside of Chile: the food. It’s back to deli meat sandwiches, pollo a lo pobre, and poorly stocked grocery stores with not-so-fresh produce. You have to go to the farmers market if you want vegetables, but they are usually held once a week—not terribly convenient while travelling. The European influences to Argentine cuisine did not make it over the Andes. We buy what we need to continue our beans and rice diet, get our laundry done, and head West, arriving at the top of the Carretera in Villa Santa Lucía just after dark. We find a nice little spot by the river on the side of the road and go to sleep for the night.